Hormel Foods Corp. engages conversations about food with a variety of heavy-hitters in the food world. Now, the company wants consumers to listen in. 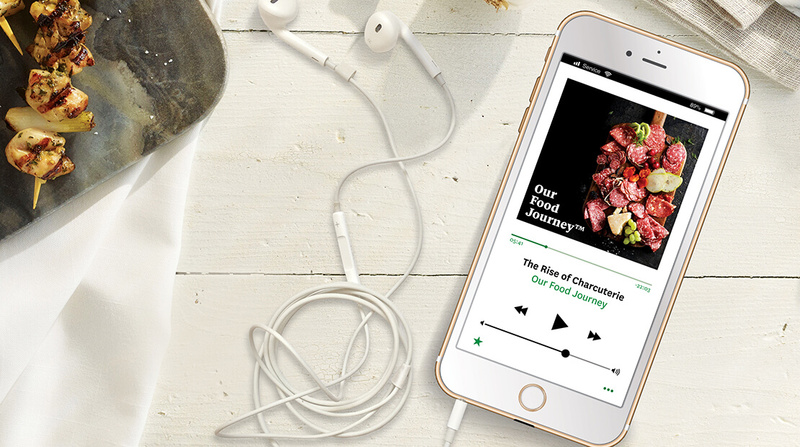 Our Food Journey is a podcast series featuring discussions with renowned master chefs, food entrepreneurs, food scientists and Hormel Foods employees. The project is part of Hormel’s larger social responsibility initiative. The first season of the podcast includes 10 episodes that are hosted by journalist and author Ethan Watters and Certified Master Chef Ron DeSantis. Featured guests on Our Food Journey include: Chef Kenneth Temple, Food Network “Chopped” champion, cookbook author and private chef; Wilson Tang, New York City native and restaurateur; Tanya Rodriguez, Ph.D., MSW, Senior cultural anthropologist at Hormel Foods; Certified Master Chef Ron DeSantis Principal adviser for CulinaryNXT; Chef Tony Finnestad, Hormel Foods corporate chef, Foodservice division; Chef Christina Machamer, Winner “Hell’s Kitchen” on FOX, private chef and sommelier; Evan Inada, customer marketing manager at Columbus Craft Meats; Certified Master Chef Adam Busby, general manager at The Culinary Institute of America, Greystone; Francisco Parada-Rabell, director of beverage innovation at CytoSport Inc. and Chef Dominic Orsini, winery chef in Oakville, California. The first season of Our Food Journey is available on iTunes, SoundCloud and Google Play Music.